I recently had a day to go birding, so I decided to look for Yellow-Billed Cuckoos. The closest reports to me were west of Phoenix along the Salt River. 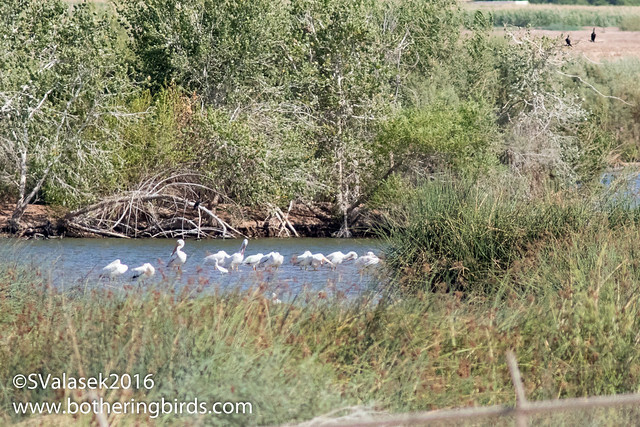 I chose the Tres Rios Overbank Wetlands as I'd been there before and I knew the area a bit. This is where the City of Phoenix cleans the water that it releases back into various rivers. A permit is needed to visit, and can be obtained via email, details can be found following this link. The majority of the wetlands are located behind a fence and only a bit of the larger ponds are visible from the road that you can walk along. Here you can see some ducks, cormorants and waders. One of the birds that are regulars are American White Pelicans, there was a group of a dozen or so there even in Summer. You can see the fence in this photo. This is from a higher vantage point, most views aren't as nice. This place really needs a raised hide like the type found throughout Europe. I noticed a large bird sitting in a far off tree. 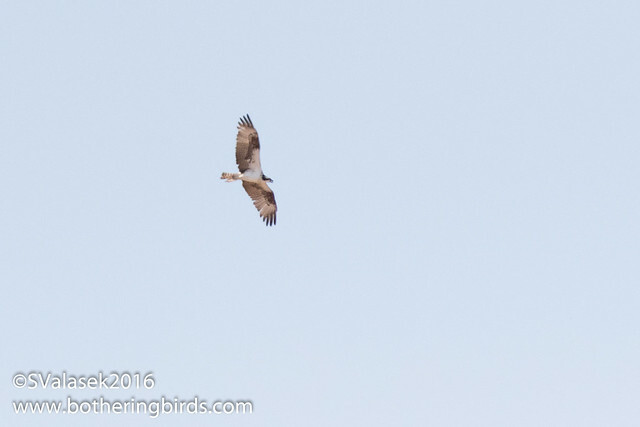 By the time I got a closer for a look it had flown, but I managed to see that it was an Osprey. It flew near another larger looking bird sitting in a different Cottonwood. The view that I got made me think that there was a pair of Osprey. And when the bird flew off holding a fish in it's talons head first, I really thought that it was another Osprey. 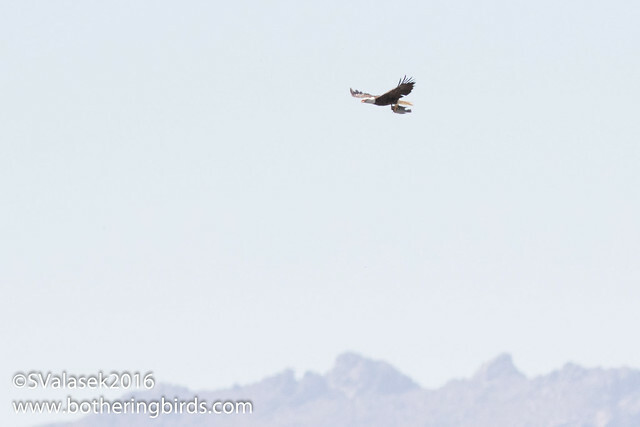 But once it got closer I was surprised to see that it was an adult Bald Eagle carrying a sunfish or maybe a bass. Along the fence at Tres Rios, there is the overflow area. Water pours through a weir under the fence and runs parallel to it. This feeds long, thick patches of reeds and cattails. They are filled with Red-Winged Blackbirds, Sora, Rails, Herons, Great-Tailed Grackles and Common Yellow-Throats. At the end of this stream is another weir with a large pond behind. 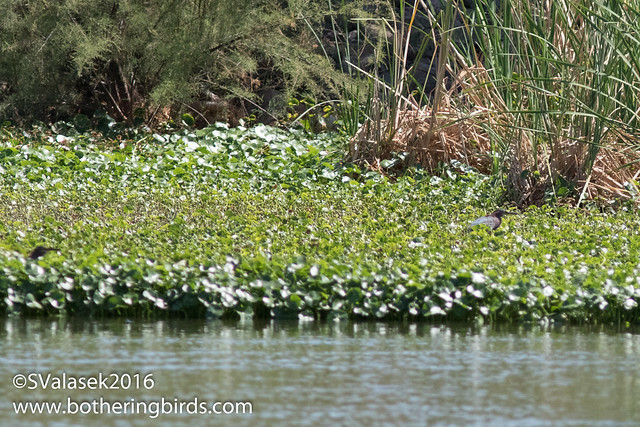 I noticed some Coots out in some low vegetation with something else lower in the leaves. 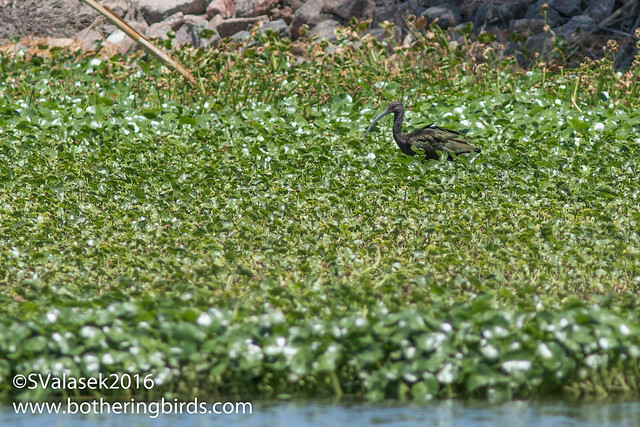 They were Green Herons stalking prey. I counted 6 for sure, but there could have been half again as many in there. Like I mentioned before, it was hot and I was feeling it. But I wanted to get to a series of smaller ponds where I thought tent worms and Yellow-Billed Cuckoos would be found. But I ended up never seeing or hearing any. 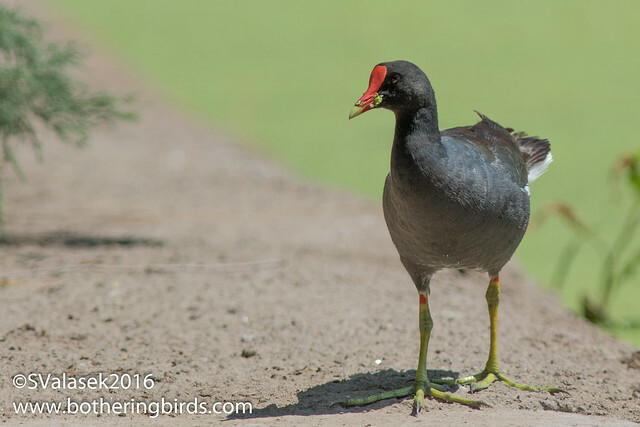 I did take a short break in one of the few bits of shade where I watched a Common Gallinule leave one of the smaller ponds and enter the next one down-stream. 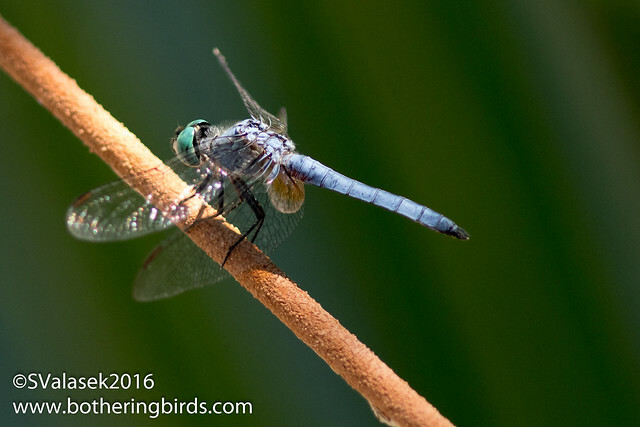 There were so many Dragonflies everywhere. 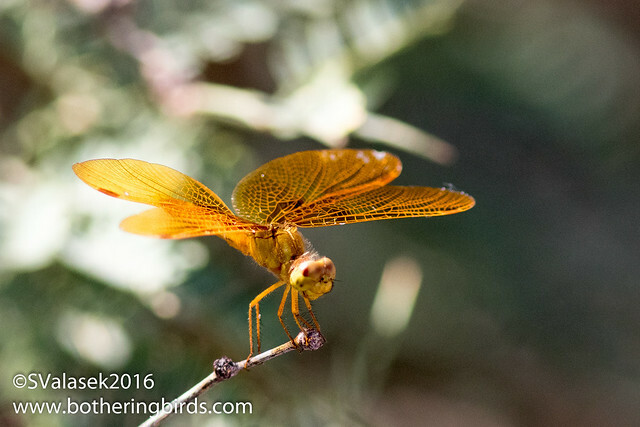 I saw some small amberwing dragonflies, which I thought were hornets at first. And so many Blue Dashers. I also got some close looks at some Black-Tailed Gnatcatchers (I initially ID'd these at BGGN due to their eye-rings and non-black tails. But the white eye-stripe is better for female BTGN - Steve), which I thought were Verdin when I first saw them. The one I saw looked a bit worn and ready for some new feathers. At this point I was running low on water and pretty sure that I was too late to hear any Cuckoos, so I headed back to the car. I made it back to the large pond at the end of the fence and took a short break there. I was looking for the Green Herons, and hoping for a Sora or Rail, when I saw a lone Ibis foraging. I had seen a flock fly into the big lakes inside of the fence on my walk out. 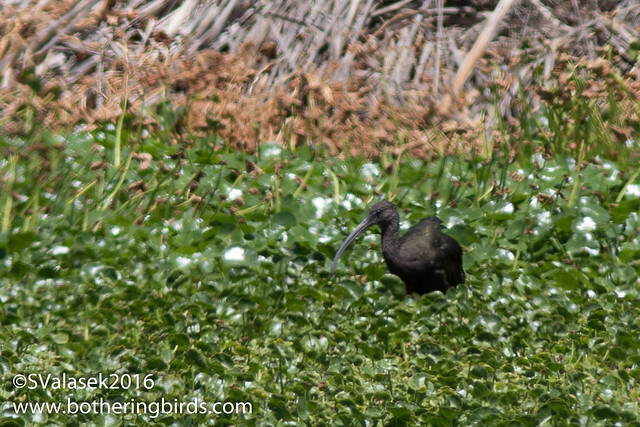 The common Ibis for Arizona and the west are White-Faced Ibis, which I assumed this one was. But as I was observing through my binoculars I didn't notice any pale areas on the face. And I noticed lots of green highlights on the feathers without any of the rusty colors from a WFIB. 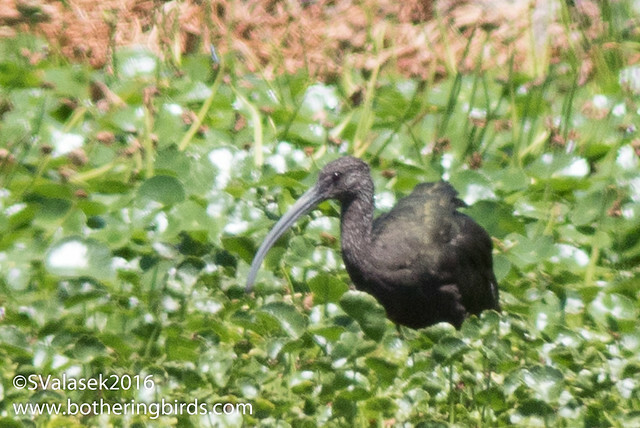 It was a Glossy Ibis! I have been looking for one in the western USA for years. I didn't have my scope with me, I don't carry that and my camera usually, so I took some time watching it and taking as many photos as I could. The bird was far off, but I managed some good shots. I cropped the photos a bit more to try and get a clear shot of the face. I didn't see pale skin anywhere. And a White-Faced Ibis would have a red iris on the eye, no matter the age. This bird was black with no signs of red tint. I adjusted the crop and shadows in Lightroom to show the face as best I could. 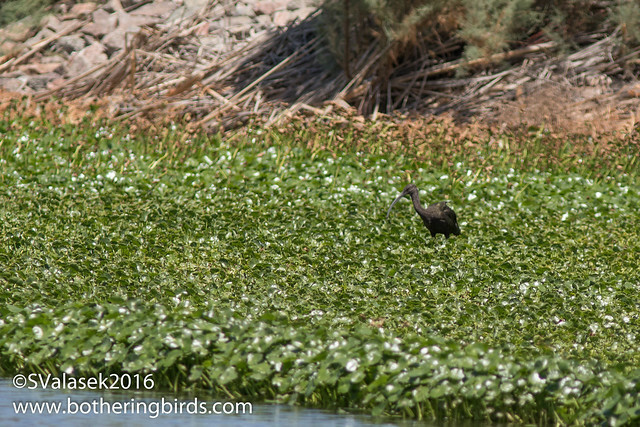 Finally, after looking at so many Ibises in New Mexico and Arizona, a Glossy Ibis. This is the default Ibis in Europe and I had seen hundreds and hundreds in Portugal and chased a few in Ireland, but this was my first tick in the USA. 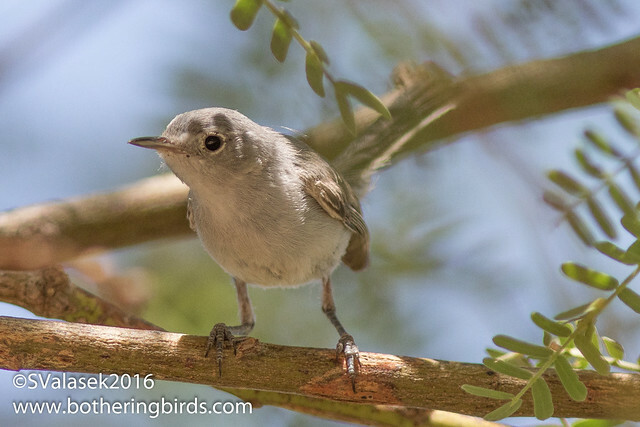 It's not the most rare bird for Arizona, but they only show up every few years. All in all a good day despite dipping on Cuckoos. The wetlands are located 20 minutes west of Phoenix. Take the 91st Ave exit from I-10 and go south towards the Salt River. The parking area is on the west (right) side of the road before a closed gate and a sign. Please do not block the gate. Tres Rios Overbank Wetlands are a private area and a permit is required to visit, simply send an email and you should get a response in a day or 2. You can find where to get on here. The majority of the water is off-limits behind a fence, but views can be made from service roads nearby. A list of the birds that you can expect to see can be found at the eBird hotspot page and at the wonderful Hotspot Birding.